Check out brand new screens of the game in action! 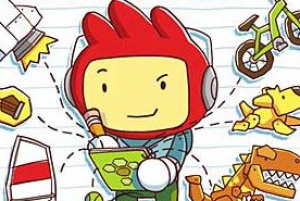 Scribblenauts gives the player unprecedented control of how the game unfolds and promises to be one of the most unique DS titles of 2009. We just got our hands on a host of new screenshots of the game in action for you to check out. You can also check out the press release snippet below for a bit more information on the game. The premise is simple: The player uses the touch-screen to help their character, Maxwell, acquire the star in each level by solving a series of puzzles. The twist is, in order to solve each puzzle the players use the notepad to write down objects that are used to reach the goal. This game is all about experimentation, imagination and endless replay value. Think of anything, write it down, and watch it come alive! Write Anything, Solve Everything! *Bring any noun to life by writing or typing it in the notepad! All objects behave as they would in real life. Flee from aggressive monsters, save a fairy princess, or swim under the ocean with a mighty whale! Whatever you imagine will come alive! *Hundreds of unique scenarios that range from simple (get the Starite out of a tree!) to complex mechanic based puzzles. Solve puzzles in dozens of completely unique ways. *Numerous environments, multiple game modes, and unlockable content provide a lasting and enjoyable experience! We'll have more information on Scribblenauts as it becomes available, as well as a full review when the game is released. I'll definitely check this out when it arrives. Okay, that was terrible, I know. I'm so excited for this game. Huh? Not exactly the most exciting screenshots but I'm still pretty confident that this game is going to be awesome! The more I hear about it, the better it sounds! I already have my copy reserved! Did you look at the actual screenshots and not just the tops in the thumbnails? Oops! Okay, that is much better! Thanks Corbie! Teasers!!! I want it now!! wow thsi game looks awesome. im going to be getting this along with mario and luigi bowser's inside story and kingdom hearts 358/2 days. This game is perfect! Will be available in brazilian portuguese language! Thx WB. This game is going to be awesome, can't wait for it. I wouldn't be suprised if NL gave it a perfect 10. I can't wait for Scribblenauts, it's going to be huge.